6pm for a prompt 6:30pm AGM start (note the early start to avoid interrupting prayer time) in the Wedding Hall, followed at 8pm by a tour of the Mosque (no shoes to be worn on the tour). The tour will be preceded by the formal Annual General Meeting, at 6:30pm. Please confirm your attendance by Tuesday 4th September 2018 by registering via the registration button below or visiting Eventbrite. Apologies and enquiries by email please to info@hackneysociety.org. This event is free to all but booking is strongly recommended, and a donation to the Mosque is appreciated. Members and non-members are welcome, but only paid-up members may vote on matters at the AGM. Note there will be no alcohol at this special event, although water will be provided. Additionally whilst shoes may be worn in the Wedding Hall for the AGM, shoes must be removed before entering the prayer hall for the tour. 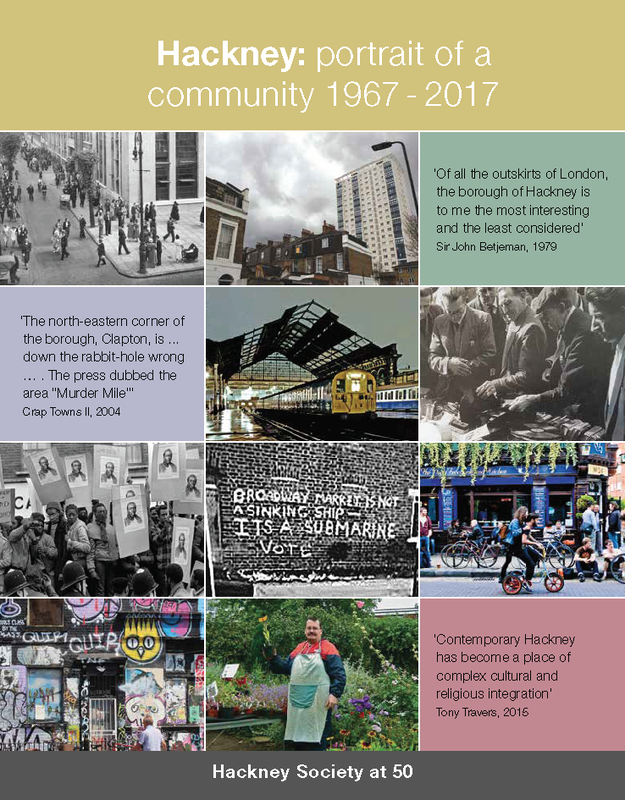 Copies of our latest book, Hackney: portrait of a community 1967 - 2017, will be available to purchase at £20 (£16 for members) on the night. NB Any member wishing to stand as a Trustee should request a nomination form by email from info@hackneysociety.org. Closing date for returned nomination forms in Tuesday 4th September 2018. The Society's Memorandum and Articles of Association are available here. Buses: 67, 149, 242 and 243 stop on Kingsland Road right outside the Mosque (Laburnum St stops KD & KL). 394 stops a short distance away on Whiston Road (WU). Overground: Haggerston Station is a 7 minute walk north of the Mosque. Car: on-street parking is limited and travel by car is discouraged. This page was added on 01/08/2018.